Miami Trace’s Breanna Eick slides safely into third base during a non-conference game against Ross Southeastern Thursday, March 28, 2019 at Miami Trace High School. The Miami Trace Lady Panthers hosted the Panthers from Ross Southeastern High School for a non-conference game Thursday afternoon. It was partly cloudy, but mild with a temperature in the mid-60s — in other words, a beautiful early spring day in Fayette County. Miami Trace had its second consecutive shutout victory, this one 12-0 in five innings. Olivia Wolffe started and was the winning pitcher for Miami Trace. She pitched five innings with two hits, no runs, no walks and 12 strikeouts. Offensively, Miami Trace collected 11 hits. “Olivia threw well again tonight,” Miami Trace head coach Joe Henry said. “I’m really proud of her. 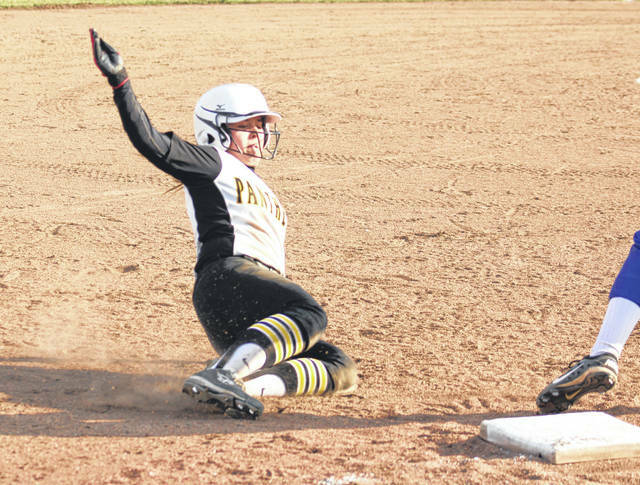 The Lady Panthers went a long way toward breaking the game open with eight runs in the bottom of the first inning. They scored one in the second and set the stage for the run-rule with three in the third. Five players had two hits for Miami Trace. Kaylee Hauck was 2 for 3 with one rbi and three runs scored. Sidney Payton was 2 for 3 with a triple, three rbi and one run scored. Jessica Camp was 2 for 3 with a home run, two runs scored and two rbi. Ashley Campbell was 2 for 3 with a double and two runs scored. Wolffe was 2 for 2 with one rbi and one run scored. Cassidy Lovett had one hit and drove in one run. Breanna Eick reached on an error and walked and scored twice. Devin Thomas was 1 for 1 with a double. Miami Trace sent 12 batters to the plate in the first inning, scoring eight times. Hauck led off the inning with a single. Payton followed with a run-scoring triple. Camp drilled a home run over the left field fence to make it 3-0. Campbell walked and scored on a hit by Wolffe. Eick reached on an error, Hauck reached on an error. Payton had her second hit of the inning, driving in two. In the second inning, Campbell hit a single, followed by a single by Wolffe and Lovett singled, scoring Campbell. In the third, Eick walked and Hauck singled, scoring Eick. Camp singled to center and Campbell hit a double, scoring Hauck. Maddie Mossbarger hit into a fielder’s choice that scored Camp. Miami Trace (2-0 overall) is back at home Saturday for a doubleheader against Whitehall-Yearling, starting at 11 a.m.
Offensively for Miami Trace: Kaylee Hauck, 2-3, 1 sb, 1 rbi, roe, 3 runs; Sidney Payton, 2-3, 1 3b, 3 rbi, 1 run; Jessica Camp, 2-3, 1 home run, 2 runs, 2 rbi; Ashley Campbell, 2-3, 1 2b, 2 runs, 1 bb; Olivia Wolffe, 2-2, 1 rbi, 1 run; Maddie Mossbarger, 0-3, fc, 1 rbi; Cassidy Lovett, 1-3, 1 rbi; Krissy Ison, 0-1, 1 run, 1 bb; Breanna Eick, 0-0, roe, 1 bb, 2 runs; Piper Grooms, 0-1; Billie Jo Seitz 0-0, roe; Hannah Miller, 0-1; Devin Thomas, 1-1, 1 2b.